Pennsylvania’s long history has allowed for the formation of many local traditions. The word Pennsylvania translates to mean "Penn's Woods". We have Quaker William Penn to thank for the naming of the state. He received what was then a proprietary colony (meaning the King had the right to divide land) way back in 1681. The first paragraph in Penn's charter or the land states "The country itself in its soil, air, water, seasons, and produce, both natural and artificial, is not to be despised. The land contains divers ('Divers' is the Old English spelling for 'diverse' meaning many and varied places, or a lot of different places) sorts of earth, as sand, yellow and black, poor and rich; also gravel, both loamy and dusty; and in some places a fast fat earth." I wonder if Penn's vision of this divers place, could have foretold the many immigrants from varying cultures that settled in Pennsylvania. German, Italian, English, Irish Dutch, Polish and more have contributed to the popular foods that have become the regions traditional favorites. 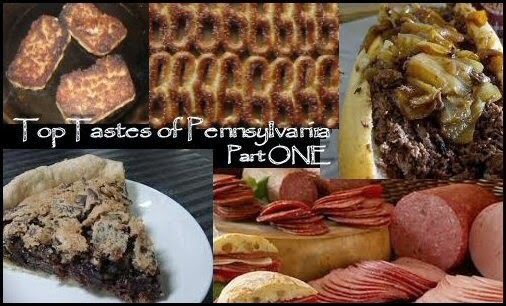 Here is part one of the RoadAbode Crew's Top Pennsylvania Foods ~ and a little bit about some of these delicious edibles interesting backgrounds. The first pretzels, according to lore were created in Europe as a reward for children learning Bible verses by either French, Italian, or German monks. These hand twisted doughy treats were said to resemble children praying with their hands folded over their chest. The Pennsylvania tradition of pretzels started in the late 18th century, when southern German immigrants introduced the pretzel to the region. The immigrants became known as the Pennsylvania Dutch or Amish, and in time, many handmade pretzel bakeries populated the central Pennsylvania countryside, and the pretzel's popularity spread. There are two basic types of pretzels found in Pennsylvania - hard and soft. 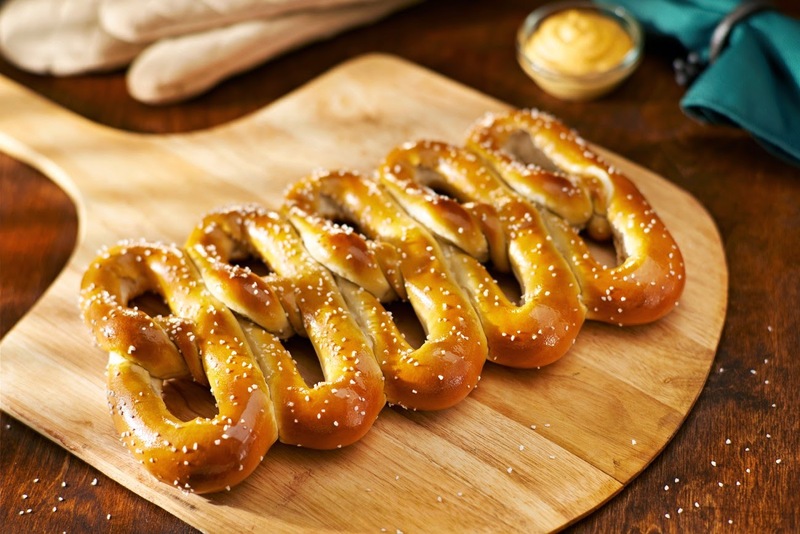 The story of hard pretzels states they were accidentally invented in the late 1600s. An inattentive apprentice in a Pennsylvania bakery accidentally over-baked his pretzels, creating crunchy, seemingly inedible, knots. His job was spared when the master baker, took an angry bite out of one ~ and loved it. Pennsylvania took the lead of pretzel baking when Julius Sturgis, a baker, fed a homeless man looking for a meal and a job. Sturgis had no job to offer, but did invite the man to stay for dinner. As a thank you from the down-on-his-luck job seeker, he gave Sturgis a pretzel recipe after the meal. By 1861 the recipe had proven to be so popular that Julius changed over his bakery to just making pretzels. This was the start of the first commercial pretzel business in the United States. Today, 80% of America’s twisty treats are still produced inside the Keystone State. Philadelphia traditional soft pretzels are distinguished by their shape, a long figure-8, not looped with a thick center and thinner ends like their Lancastor County counterparts. They also have a softer, chewy texture. Soft pretzels can be bought lightly salted, or, on request, as “baldies" - meaning no salt. For many years pretzels were bought mostly from street-side vendors or corner newsstands. I can still remember in the 1970s as a boy buying pretzels from "Pretzel Pete", an immigrant pretzel vendor of indeterminate ethnic origin. Four for a dollar (or five if Pete like you) for a salty doughy treat after school, that would keep you and three friends going until dinnertime. Though they are still sold by street corner vendors, Philadelphia pretzels are also sold from storefronts, convenience stores, and even specialty soft pretzel "botique" shops. http://www.juliussturgis.com - Legend places this as where it started in Lititz, Pennsylvania. Cool Tour! According to a 1987 exhibition catalog published by the Library Company of Philadelphia, the cheesesteak was created in the early 20th century "by combining frizzled beef, onions, and cheese in a small loaf of bread," These days these deliciously messy sandwiches include thinly sliced sautéed ribeye beef and a variety of melted cheese choices. According to legend, in 1930 Pat Olivieri, a South Philadelphia hot dog vendor, one day decided to put some beef from the butcher on his grill for his lunchtime sandwich. A passing taxicab driver noticed the alluring aroma and asked what Olivieri was making, and could he make a sandwich for the driver too. As the story goes, within a day rumor of the delicious lunch had spread, and cabbies around the city came to Olivieri demanding steak sandwiches. Often imitated but not duplicated by the major food chains, this sandwich is unique to the mom and pop shops in the Philadelphia region. Check this link by "Visit Philly" to see a list of the best places to get a cheeseteak. The RoadAbode Crew and Jimmy Fallon of the Tonight Show are partial to #8 . Personally, I love them with hot peppers, provolone, fried onions, and mushrooms. No "Cheeze Whiz" for me, thanks. Scrapple is made from pork. To put it delicately, parts of the pig (like head, heart, liver, and other trimmings) that would otherwise go unused. It's tradition comes from Amish farming families wanting nothing to go to waste.The meat is cooked (sometimes the whole hog head is cooked), then finely minced. The meat is returned to the pot and seasonings, typically sage, thyme, savory, black pepper, and others are added. The mush that is created is formed into loaves and allowed to cool thoroughly until set.The meat is formed in a similar way to meatloaf, then cut into slices and fried. This dish is a specialtiy to the Philadelphia and Lancaster County region, and is not found readily nationwide. Scrapple is often eaten for breakfast, sometimes as a sandwich or with eggs. Stop in a local Pennsylvania diner or breakfast restaurant, and you will find scrapple. Most of the Lancaster area restaurants and bakeries sell this popular dessert. 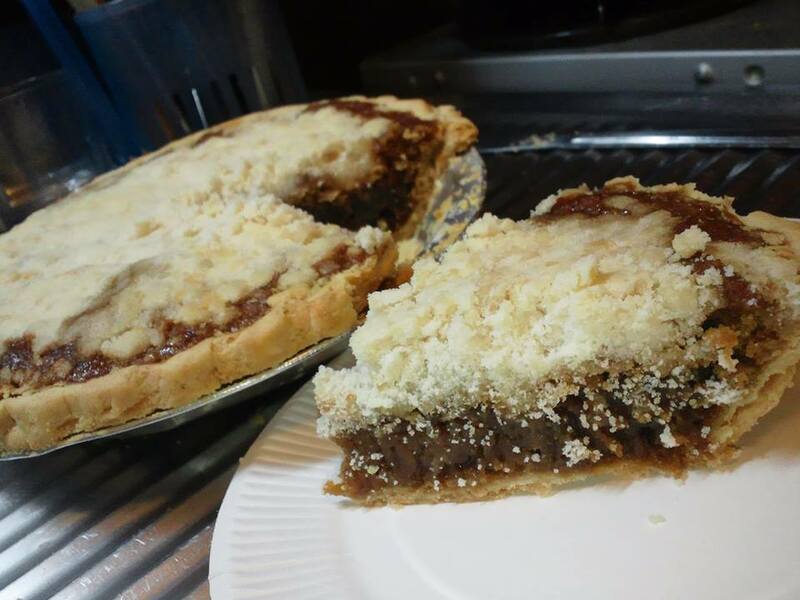 A treat originating from Pennsylvania Dutch households, the pie is so named because the sweet molasses which could pool as the pie was left to cool, attracted flies that must be "shooed" away. The shoo-fly pie's origins may come from the treacle tart (coincidentally Harry Potter's favorite dessert) with the primary difference being the use of molasses than treacle. The crust is dry topped with a sugar, flour, and butter crumble, while the bottom of the pie can be thick with molasses or just barely visible and is referred to as either "wet bottom" or a "dry bottom." pie. Check in here for where the RoadAbode Crew likes to grab a slice, or a whole pie! Lebanon Bologna appears like a darker version of salami, with a unique tangy flavor. This flavorful meat's seasoning process includes being slow cold smoked at a temperature below 120 °F (49 °C). The adding of curing salts to control microbial growth during processing was developed in the 19th century by the Pennsylvania Dutch of Lebanon County, Pennsylvania. This Pennsylvania favorite reflects the slow-cured and smoked sausage traditions brought from northern Europe. There are several versions available like original, sweet, honey smoked, or double smoked, and quite often is served as sliced lunch meat. Lebanon bologna also is a great appetizer, cubed or thickly sliced with seasoned crackers and artisan cheeses. 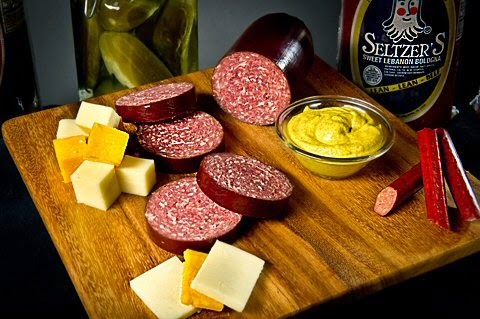 Check out Seltzer's Lebanon Bologna who have been doing it right for over 110 years. What's your Favorite Taste of Pennsylvania? While writing and researching the history of these foods, I was reminded how thankful I am to have been raised in Philadelphia, and how much I love the special tastes unique to this region of the United States.The foods in this two part article are some of my "comfort foods" - foods that remind me of home and just have a special place in my heart. I don't eat as many Cheesesteaks as I use to, but still do have a hoagie and soft pretzels every few weeks. What foods remind you of home, or are your "go to" comfort foods? We'd love to hear! Happy RVing! Be sure to check part two for more of our favorite foods of Pennsylvania. Is you mouth watering yet? love to eat at Shady Maple!